Being born on the 8th of February 1972 in Highfield Harare in Zimbabwe. Michael is the Artistic Director/Choreographer of the group Pamuzinda the group he co-founded together with a friend and colleague Nicholas Mazenda. Did his primary and secondary education in Highfield Harare Zimbabwe. Only because of the love and the passion of preserving culture and pass it on to next generations through performing arts was and still is the main factor which drove these two friends to form the group. Michael started his career at a very tender age of 5yrs as he is born in a family with a background of a typical Zimbabwean tradition. Traditional ceremonies where mbira instruments and traditional dances are performed occasionally took place at his homestead. QUOTE: 'I was watching them when ever they were performing at these ceremonies then I just tell myself that I can also do this and from there I started trying it on my own.” He then taught himself the art of playing instruments, singing and dancing that resulted in him being a multi-instrumentalist. He used to collect empty bottles and tins and create sounds by hitting them. QUOTE: ' I could spent the whole day hitting the bottles and the tins that sometimes i forget of eating and I had my audience from my friends and people around who always come to watch me play, dance and sing.” He got the experience as he grew up and perfected his talents in music, dance and theatre arts by practising everyday as well as performing with Pamuzinda and other renowned artists locally and internationally. Michael have being travelling around the globe as a performer and instructor as from 1994 until to date on his mission to pass the message in preserving and sharing his culture to the world. 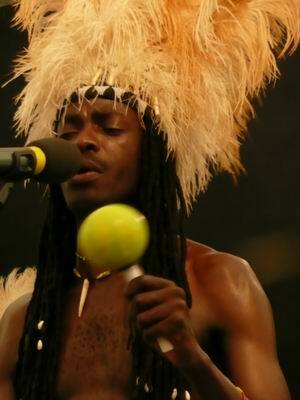 He has held successful workshops in Voice training, dance and instrument playing mainly his own traditional instruments of Zimbabwe the mbira, marimba and ngoma (traditional drums) in countries like Belgium, Italy, United States of America, United Kingdom, Canada, Germany, Japan, Luxenbourg; Netherlands, South Africa, Zambia also not leaving his home country Zimbabwe. Apart from working with Pamuzinda Michael has been also working with other artists from his home land providing his services as a session/hired artist that also contributed for him to gain the much experience he possess today but that never make him forgot about his group because that's where he belong and Pamuzinda is his home. OTHER DETAILS: 1990-2000 Choir Master and voice trainer for Catholic youth in Zimbabwe. 1990-1991 Worked with a traditional dance group Young Zimbabweans as a dancer. 1991-1993 Worked with a Zimbabwean traditional music group Vadzimba as a bass player as well as the group's drummer. 1995-2006 Worked, performed and toured around Zimbabwe, Regionally and Internationally with one of Zimbabwe's celebrated and International star Stella Rambisai Chiweshe The mbira Queen of Zimbabwe playing mbira, marimba, traditional drums as well as a dancer. 2000-2006 Worked as an Instructor in music and dance for a project Music Cross Roads, a project designed to help young and up coming artists of Zimbabwe who have a passion for performing arts.